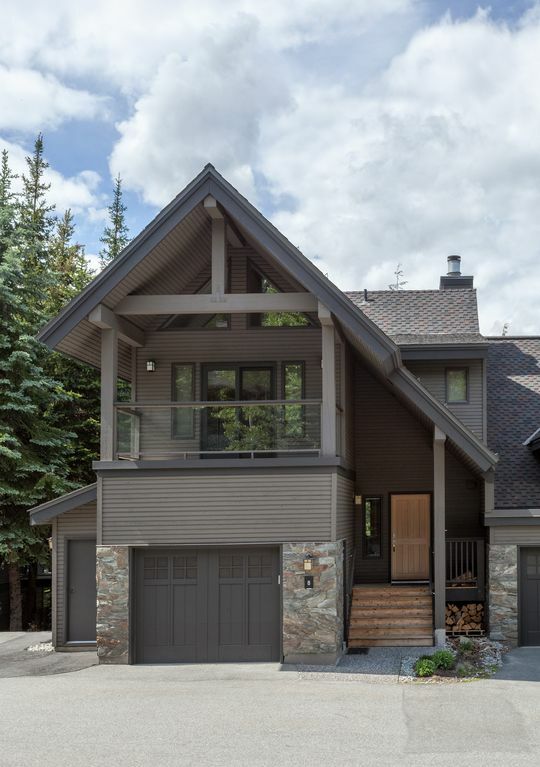 HUGE RENOVATION...brand new $800,000 spent on the entire unit...ready for ski season. Non-Smoking townhouse has Ski In/Ski Out to of both Whistler and Blackcomb Mountain and is a five minute walk to Whistler Village. It has a private, outdoor HOT TUB and wireless internet. The main floor has a full kitchen, living room, powder room, and dining area. The dining area, which has a view of the beautiful mountains, seats 10 people with two additional bar seats facing the kitchen. The upper floor has the master bedroom with a King-size bed, TV, and full bathroom with tub. The lower floor has three bedrooms. The first one has a queen-size bed with LCD TV/DVD combo with private full bathroom containing a shower. Second bedroom has four beds (1 set of adult twin bunks and 1 bunk with a twin on top and a double on bottom) with LCD TV/DVD combo. Third bedroom has a queen bed with a single bunk on top and a LCD TV/DVD combo. These two bedrooms share a full bathroom with shower. The laundry with washer and dryer is located on the main floor. We love to ski and enjoy the snow! The location is the best in Whistler...you can ski-in/ski-out to both Whistler and Blackcomb and you are a 5 minute walk into Whistler Village. The best location in Whistler. A private outdoor hottub! Great house. Big enough for our group with room to spare. Easy ski in/ski out. The house was just as we'd expect from the pictures. Really nice contemporary finishings with homey and comfortable feel. Good for young kids. The hot tub worked wonderfully with a nice view of the forest. The ski in/ski out was easy and close by. Any questions to the owner were responded to quickly. This townhouse is the perfect place to stay in Whistler. It is conveniently close to everything Whistler has to offer and located in a very charming and quiet community. It has great amenities, is very spacious and comfortable. There is a beautiful view of the snow capped mountains from the kitchen/living rooms. We visited over the summer. I imagine it is just as beautiful in the winter with ski in ski out just feet from your door. I highly recommend this home. Great house in an incredible location. Great spot, close to the slopes. Cedar Ridge is a great spot, close to the village with everything you'll need. We'll be coming back. We had a perfect week in this spacious and well equipped condo and the surrounding area was surprisingly quiet during the weekdays of our late February stay. The owner was quick to answer our questions prior to and after deciding to rent his place. This is now our favorite place in Whistler/Blackcomb. Ideal town home and location - Planning to Stay Again! Our family of 6 adults and 2 children, age 3 & 6, thoroughly enjoyed our one-week February stay in David’s townhome. David responded promptly to all our enquiries and accommodated our early afternoon arrival in Whistler -first by allowing us to store our equipment and luggage in the garage and then informing us the day before our arrival that the townhome would be ready by 1:00 pm. The spacious and well-appointed townhome easily accommodated our group, providing numerous spaces for relaxing after a day on the slopes. The modern kitchen was well equipped for food preparation and serving. The hot tub was used extensively and mid way during our stay was serviced by the Georgena, the property manager. The garage, with the boot & glove heater, was a great space to store ski equipment, helmets and ski jackets. The townhome is certainly a ski in/ski-out as it is approximately a one minute walk from Whistler’s Village Run. During our shopping trips in Whistler Village, we found taxis a convenient and inexpensive (between $7 -$10) way to bring back our grocery bags from the IGA, located at the Marketplace. Within 5 working days following our departure from Whistler, our damage deposit showed up on our credit card. We are already planning next year’s trip to Whistler and hope our group will once again be available for the trip, thereby ensuring that we can once again enjoy the location and amenities of David’s townhome.